One pair down, 11 more to go. They’ve actually been done for over two weeks, I just couldn’t get around to blogging about it. They are simple picot edged top down socks. The yarn is from my Sundara subscription. When I first started these, I wasn’t sure about the yarn. It was ok, but was seeming a little yellow. Now that I’ve finished, I really like the yarn. And the socks. The first half of the first sock took me over 6 months. The rest of that pair and the second sock took me about five days. Can I Knit 12 Pairs Of Socks In a Year? I lean towards no, but we’ll give it a shot. What brings this up you ask? Well, we bought my mother-in-law, Jeanne, the Yarn Harlot’s page-a-day calendar for Christmas. Jeanne is a knitter and we thought it a good gift. It’s not quite as overwhelming as a stitch-a-day kind of thing. Those are nice but that’s a lot of stitches to keep track of. Jeanne emailed me a tip she read from her calendar. The tip was to create your own sock of the month club from stash yarn and patterns you have queued up. I’m going to interrupt myself and ask a question: Is my sharing this violation of some copyright or something? I prefer to think of it as unpaid advertising in that Jeanne really likes the calendar and if you enjoy tips like this, pick up the Yarn Harlot’s page-a-day calendar, available at Amazon or other fine retailers. Hopefully that has covered some bases that may or may not have needed covering. So last night (see how exciting Saturday nights can be!) I pulled out my sock yarn and my sock patterns. Scary thing, I actually have enough yarn for 12 pairs of socks. That surprised me. In reality, I have 11 plus two on the needles. My January sock is going to be one of those WIPs. The other on the needles is a pair of knee socks. I also laid out another pair of knee socks but swapped that out for a pair of regular sized socks. In my mind, one pair of knee socks is about two pairs of regular socks knee. Thusly, knee socks are separate projects from this challenge. 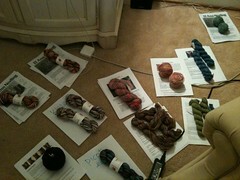 The rest of the yarn has been matched up with patterns. I have 6 “hard” pairs and 6 basic pairs. If all goes according to plan, by the end of the year I will have 12 pairs of completed socks. This challenge seems, well, challenging. I don’t know if I’ve even completed 12 total projects in a year. Regardless, nothing ventured, nothing gained and this seems like a fun way to get some socks knit up. Wish me luck! I don’t know what’s wrong with me. I have a couple of projects in progress, plenty of projects in my stash, and I bought another one. I blame my husband. I was bored during my lunch hour and my husband didn’t answer my calls so I went to the knitting store. And I bought a new sock project. In the whole scheme of things, I could have done more damage. It was a crisp fall day and I felt like starting a pair of socks. 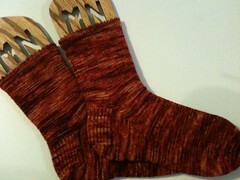 I picked out a cool pattern by Mountain Colors – Jonesy’s Toe-Up Socks. They have cool twisty cables. I’m knitting them in this beautiful autumn-ey color by Colinette named Copperbeach (part of the Jitterbug line). I spent some time relaxing, watching The Unit and working on my socks. A very nice way to end the day!